All Those Beauty Mysteries We’ve Wondered About - Answered! Gather around ladies, because we’re going to attempt to answer some of those beauty questions that everybody has a different opinion on. Whether they are old wives tales or some truths that need to be paid attention to - we’re spilling the beans and busting some myths on beauty mysteries that have eluded you for years. We know every girl has wondered about these multiple times, so here are definite answers to these age-old beauty doubts. Question 1: Is wearing makeup after getting a facial bad for your skin? Many of us know that it’s not advisable to wear makeup after a facial, but is that really true? Well, it actually depends on your skin’s sensitivity. If you know your face takes time to go back to normal after a facial then avoid makeup or even strong face washes and creams. The best time to get a facial is in the evening, when you know you’re going straight home and don’t have any plans, your face is ready for bed and can get all the rest it needs. However, if you’ve had a facial in the morning and your party is at night, you could get away with wearing makeup. Don’t go overboard with your base, after all your skin is still a bit fragile. Your pores have just been cleaned and are susceptible to dirt and grime, and even makeup build-up can cause breakouts. So the longer you wait before applying makeup, the better. Question 2: How much hair fall is too much? Many hair specialists will say that 60 -100 strands a day tends to be normal. In general, 90% of your hair goes through the growing process while 10% is in the resting phase – which means you can expect 10% of your hair to fall. Now, different people have a different percentage of resting/growth phases. Hence many people will experience more or less hair fall when compared. Hair fall can also be related to crash diets, hormonal imbalances, high fevers or a stressful month at work. 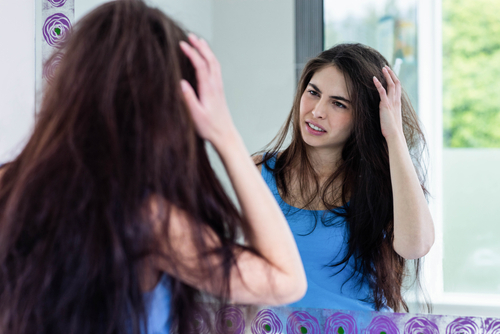 These causes can affect hair for up to 6 to 10 weeks, so make sure to treat yourself right, eat right and stay cool, as it can have ramifications on your gorgeous locks. If you feel that you’re hair fall is more than normal then consult your doctor or a hair expert. Question 3: Why do my nails turn yellow after I use some nail polishes? Put your hands up if you have used cheap nail polish, because the colour was cute - only to realise your nails have turned yellow after you remove it. Actually, repeated use of any nail polish will discolour nails, and there is no real way to prevent it. However, you can use a UVA/UVB protected top coat as a base before you apply any colour – this shields nails from the sun. Sadly that’s the most you can do, other than allowing your nails to breathe and going nail paint-free in between mani sessions. Depending on the pigments and chemicals in the polish, your nails will mostly always have a bit of an off-hue. Question 4: Will wearing makeup everyday really damage my skin? Actually, no! While it’s always great to give your face a breather, if you’re using quality makeup, there is no reason it should damage your skin. The real damage comes from not taking your makeup off. Not washing your face and scrubbing that makeup off is the real culprit. It also depends on how much makeup you’re wearing, if you’re doing very heavy makeup then your skin might feel dehydrated after a while, but again, nothing that can seriously damage skin in the long term. Healthy skin is about keeping hydrated, eating right and having a solid beauty regime. Question 5: Do makeup and beauty products really expire? We are all guilty of using that year 2-year old eye-shadow palette; yes we’ve all done it. However, it’s really important to throw out products that have gone passed their expiration date. Let’s put it this way, if a certain medication has been on your medical shelf for a couple of years would you still take it? Our point exactly! It may look alright, but its effects aren’t as strong and could be bad for your skin. The rule of thumb is that mascaras should be replaced every 3 months, eyeliner and shadow every 6-12 months and lipstick every one and a half years. So keep a check ladies! Question 6: Do I really need to get a Manicure/Pedicure every 2 weeks? Let’s be honest, not everyone has the time or the budget to get their nails done so regularly. Some people’s nails grow a lot faster than others, but around 3 weeks is where you can noticeably see a difference. Yet, it all depends on your lifestyle. If you’re constantly on the go and working a lot with your hands, then your nails are probably getting the brunt of it and need some TLC. If this is the case, we suggest getting one, every two weeks. This is especially true if you have a career in PR or events where you always have to look groomed. If however you’re quite careful and live a leisurely lifestyle then once a month will do. However If you’ve got some nail art or colour, you may require touch ups every 2 weeks. Hope this was helpful! Question 7: Where do all our hair ties and bobby pins go? Now this is something even we can’t answer! The average girl probably buys hair ties by the dozen every 2 to 3 months, yet where do these hair ties go!? It seems like the only place that is safe for these hair ties are our wrists, but even then we manage to misplace them! The same with bobby pins, they are always hiding at the back of some drawer or swept away by the maid the next day. When you really need one you can’t find them anywhere - it’s incredible. Our best guess - bobby pins, hair ties, earring closures and socks are all having a party in that black hole behind our closet!